The world’s largest halal trade show returns for its highly-anticipated 15th edition. WEDNESDAY, 14 MARCH 2018, KUALA LUMPUR Malaysia is once again setting itself up as a leading influencer and industry player in the global Halal economy by hosting the 15th Malaysia International Halal Showcase (MIHAS) from 4th to 7th April 2018 at Malaysia International Trade and Exhibition Centre (MITEC), Kuala Lumpur, Malaysia. Organised by Malaysia External Trade Development Corporation (MATRADE) under the patronage of Ministry of International Trade and Industry of Malaysia, MIHAS is the largest Halal trade event of its kind in the world. Whilst the exhibition logged its largest edition in 2017, recording 22,000 visitors from 80 countries, this year MIHAS is set to double in size. The exhibition features products and services across seven industry sectors: Food and Beverage, Pharmaceuticals, Cosmetics, Tourism, Finance, Logistics and E-commerce. According to Ir. Dr. Mohd Shahreen Zainooreen Madros, Chief Executive Officer of MATRADE, ‘the overwhelming interest in MIHAS reflects the bullish sentiment of the global Halal industry. Of the 800 companies that are expected to participate this year, as high as 32% of exhibitors are new-to-market while the remaining 68% are repeat and long-term participants’. ‘41 countries so far have registered interest to participate, representing 45% of the total occupancy of MIHAS 2018; the rest of course being Malaysian companies. I am happy to note that India are among the top 6 countries having the largest pavilion at MIHAS, alongside Thailand, Indonesia, Taiwan, Iran and China.’, he added. MIHAS has been a highly effective sourcing platform, steadily recording over USD 4 billion in cumulative trade for its participants. As the world’s largest Halal tradeshow, MIHAS will continue to lead and serve the industry by fostering business and investment in the Halal domain. This year, buyers at the exhibition can expect to find the latest Halal product offerings and services across industry value chains. From Halal ingredients, to semi-finished products and manufactured goods, to packaging and logistics, to Shariah compliant financing and Takaful, MIHAS has become an indispensable annual one-stop centre for traders in this burgeoning economic sector. Thomson Reuters in its latest State of The Global Islamic Economy Report predicts that the potential size of the Muslim market will reach USD 3.081 Trillion by 2022. Total Muslim spend across lifestyle sectors already represents nearly 12% of global expenditure. The number of exhibitors MIHAS has received this year is very promising. It will be welcoming 10 countries which have not previously participated in MIHAS before with at least 40 countries participating as exhibitors. With these encouraging responses from local and international companies, it is evident more companies worldwide recognise the value of participating in MIHAS. This is supported by the fact that almost 70% of exhibitors are returning exhibitors. With the addition of newcomers in this year’s exhibition, MIHAS 2018 is also set to offer a wider range of products. Visitors to MIHAS 2018 this year can expect a lot more than just a diverse international glimpse into Halal products and services. Alongside the exhibition are a multitude of programmes and engagements designed to keep buyers and traders alike informed on the latest developments and trends in the Halal industry by experts from around the world. MIHAS’ programmes are jointly organised by MATRADE with various stakeholders that include JAKIM, the world’s leading Halal Accreditation and Certifying Body; Bank Negara Malaysia – Malaysia’s central bank; the Islamic Tourism Centre; the Malaysian Association of Travel and Tour Agents; and the Malaysia Retail Chain Association to name a few. 1. 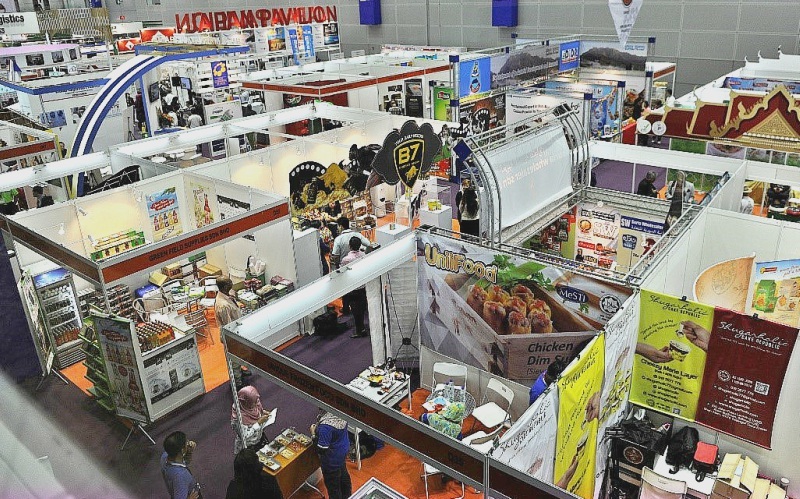 The Malaysia International Halal Showcase is an annual dedicated halal trade show. The event covers 7 industry sectors – Food & Beverage, Pharmaceuticals, Cosmetics, Islamic Finance, Logistics, Digital and E-Commerce, and Muslim-friendly Tourism. MIHAS in 2017 attracted 576 exhibitors from 33 countries and was visited by 22,744 trade visitors from 80 countries. MIHAS 2018 will be held from 4-7 April 2018 at the Malaysia International Trade and Exhibition Centre (MITEC) in Kuala Lumpur. 2. Malaysia External Trade Promotion Corporation (MATRADE) is Malaysia’s national trade promotion agency under the Ministry of International Trade and Industry. MATRADE develops and promotes Malaysia’s global exports through 47 offices worldwide. 3. For the past three consecutive years, Malaysia has been ranked the number 1 halal economy according to the Global Islamic Economy Report produced by Thomson Reuters. The Global Islamic Economy Indicator (GIEI) is a composite weighted index that evaluates by countryand the quality of its overall Islamic Economy ecosystem. Malaysia’s exports of halal products was valued at RM 42 billion last year, with the main export items being Halal food and beverages followed by Halal ingredients and palm oil derivatives. Among Malaysia’s top export markets are China, Singapore, the United States of America and Japan. In addition, Malaysia’s Halal exports are also projected to contribute 8.7% to Malaysia’s Gross Domestic Product (GDP) by 2020, indicating its importance to the nation.